The pictures on this page are not of my normal standard, but I'm still a beginner in underwater photography. If you have an advice how to avoid the continous fogging of the camera case, go ahead, I'll appreciate. 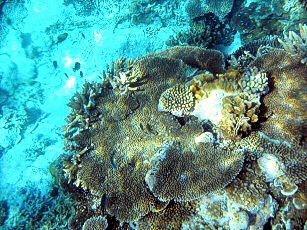 Anway, the sights around the island are nice, even when snorkelling. 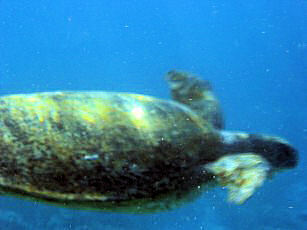 There is a vast amount of large fish around the reef, but sadly we couldn't find mantas, which regular visit the place. Coral life is rich, but small in size. 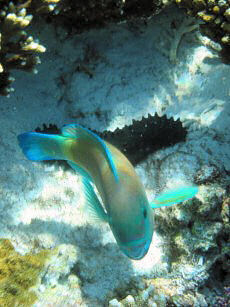 Sure one always enjoys the colourful reef fish like butterfly fish and many others. And some of us were attacked by a trigger fish. Possibly it protected some eggs we didn't even were aware of. Few weeks later the turtles would come ashore to lay their eggs, but we were happy to see them at all - and we did on every dive and snorkel. And of course, the far best shots were possible when the camera was still in my room. Diving around Lady Elliot is a nice thing to do if you bring your own skills and buddy. But the dive education there is nothing I would recommend. The courses I took there were far below standard level.